Bonita Mae Ellis, age 91, lifelong resident of Hibbing died Monday, December 17, 2018, at St. Luke’s Medical Center in Duluth. She was born April 5, 1927, in Hibbing the daughter of Carl and Celia (Morrissey) Lindgren. Bonnie was a graduate of Hibbing High School. Bonnie was united in marriage to Richard G. Ellis on May 21, 1949, at the First Lutheran Church in Hibbing. Bonnie worked as a Secretary for the Hibbing School District retiring with over 25 years of service. She was a member of First Lutheran Church in Hibbing. 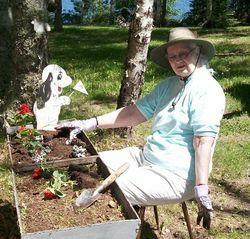 Bonnie enjoyed watching sports, especially the Minnesota Twins and Timberwolves, reading and spending time at the cabin. Bonnie is survived by her children: Linda (Martin) Kiesling of Duluth, MN, Vance (Julia) Ellis of Minnetrista, MN, and Grant Ellis of Hibbing; sister: Janet (Darnell) Blume of Ramsey, MN; brother: William (Mary Lou) Lindgren of Merrillville, IN; grandchildren: Marti (Craig) Severs, Nicolas Ellis, and Kevin Ellis; and a great-granddaughter: Emmalyn Severs. She was preceded in death by her parents; and her husband: Richard in 1968. Visitation will be from 10:00 am until the 11:00 am Funeral Service Friday, December 21, 2018, at the First Lutheran Church in Hibbing. Pastor Sarah Fike will officiate. Interment will be in the Hibbing Park “Maple Hill” Cemetery in Hibbing.